GUERRILLASTAR MILLS WRAPS ON HIS FIRST FEATURE FILM “THE BIG SOMETHING”! Photo taken right after Travis Mills yelled "cut" on the final shot for his first feature film "The Big Something". with determination and the good ole creative spirit. You see, my heroes did it in less time. Edgar G. Ulmer made the best Film Noir of all time, a masterpiece called Detour. And he did it in only seven days. That’s right, folks, seven days. Kudos to the entire cast and crew of “The Big Something” for their serious accomplishment! My hat goes off to you! 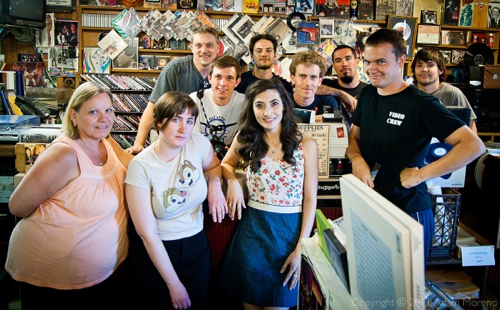 Photo of the cast and crew of "The Big Something". You can read more about “The Big Something” at their blog The Big Something which contains numerous posts documenting the film’s journey into creation. 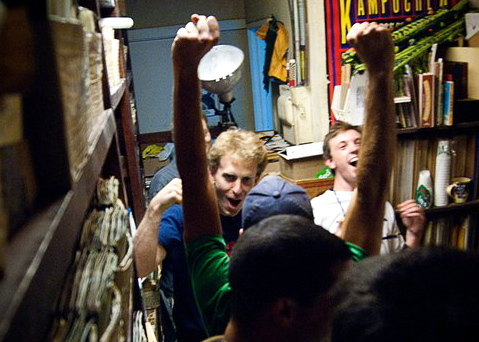 Lewis is a loser-record-store-junkie. His boss has given him permission to sleep on the floor of the store. However one night when Lewis returns and opens the door, a startled cop yells at him to freeze. It’s then that Lewis sees his boss Marcus, lifeless on the floor. Marcus would never take his own life, but then who killed him? ← Guerrillastar Productions Releases “Bloody Basin” (2009) On Vimeo and YouTube!